Labor mobilization on June 4 was the first significant labor action against white supremacists in decades. 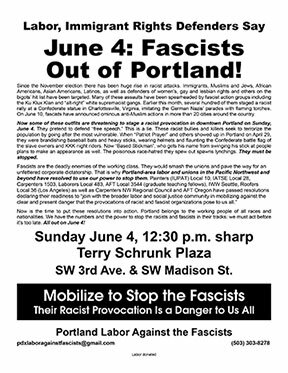 PORTLAND, OR – The rally here on Sunday, June 4 of white-supremacist and outright fascist Trump supporters was surrounded by far greater numbers of furious protesters outraged by this brazen provocation barely a week after the double murder by a local Nazi. 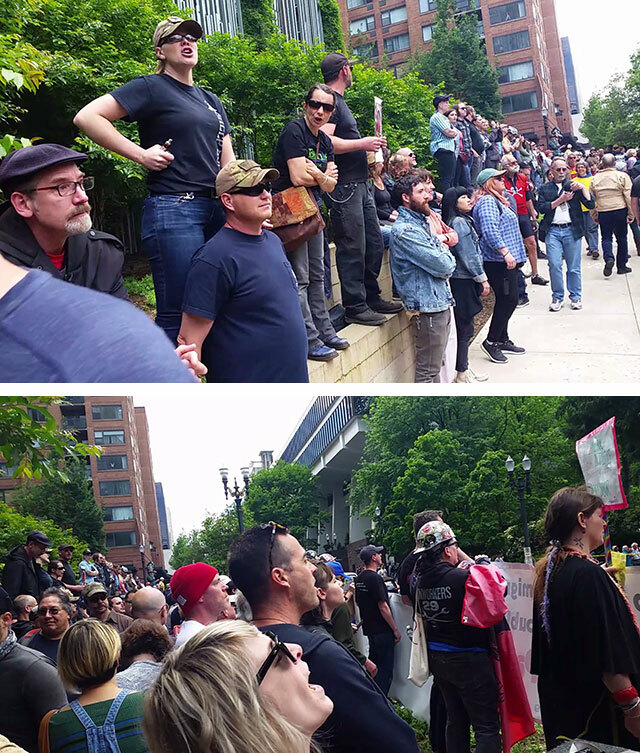 One of three protests, a mobilization called by Portland Labor Against the Fascists, brought out several hundred union members and supporters who gathered to the east of Terry Schrunk Plaza, where the race-haters were protected by triple lines of heavily armed local, state and federal riot police. 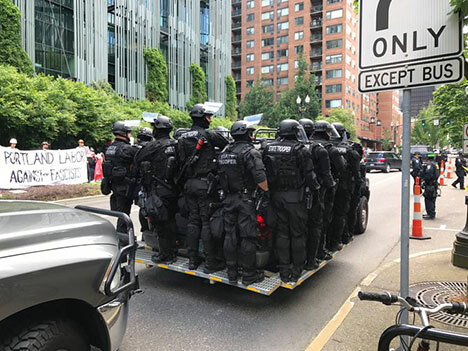 Meanwhile, an army of police from seven different jurisdictions turned downtown Portland into a police state to ensure that the racist provocation proceeded. Specially outfitted copmobiles, each with a dozen black-clad state police standing on the running boards circled the plaza where the ultra-rightists were gathered. 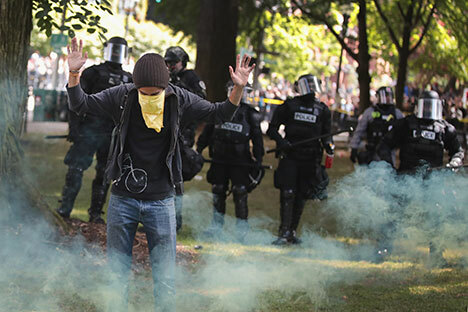 After a standoff of several hours, the police unleashed volleys of flash-bang grenades, rubber bullets and tear gas to clear anti-fascist protesters out of Chapman Square just to the north of Schrunk Plaza. As they did on May Day, the police “kettled” the entire area, holding 200 people on the street as they IDed everyone and picked out individuals to be detained. Fourteen arrests were reported. We demand that all antifa and other protesters arrested on June 4 be released and all charges dropped, and the same for those arrested on May 1 and those who were protesting a prior racist rally on April 29. The labor mobilization stood its ground to the very end, with non-stop chants and speeches that reverberated throughout Terry Schrunk Plaza and the surrounding area for over six hours. Worker activists stood proud and loud behind their union banners until the last of the racist and fascist scum exited on buses protected by the police. This marks the first significant working-class action in the U.S. against white supremacists in decades. 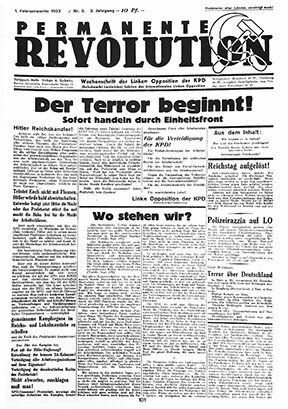 The importance of this mobilization goes beyond denouncing the few hundred reactionaries across the street, and the horrific lynch murder by one of their number nine days earlier. June 4 was an important first step in bringing out the power of Portland’s labor movement in defense of working people, immigrants, Muslims and all those targeted by the all-round reactionary offensive coming out of Washington. It points to the potential for organizing workers defense guards that could send the fascist vermin scurrying back into their holes. And it sharply posed the need for a workers party fighting to overthrow the capitalist system that breeds fascism, and to replace it with the liberating rule of the working class. Painters and Drywallers Union Local 10 calls to break with all the bosses’ parties and for a workers party. The big business press “even-handedly” described the hours-long confrontation as “dueling protests” (The Oregonian). “The many extremes of Portland collide in protest,” said CNN. The Washington Post talked of counter-protests against a “free speech rally.” These mouthpieces for official ruling-class opinion peddled the white supremacists’ claim that they were just defending constitutional rights. 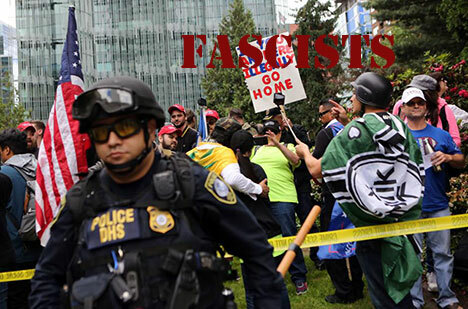 Countering this sinister ploy, the call issued on May 24 by Portland Labor Against the Fascists warned: “They pretend to defend ‘free speech.’ This is a lie…. The poisonous race-hatred they spew out spawns lynchings. They must be stopped.” Two days later, the Nazi racist, well-known to Portland police, carried out a lynch murder on the MAX train. Click on image for text of call for labor mobilization. The major media tried to disguise the huge disparity in numbers, but Willamette Week noted that “the socialists, labor unions and anarchists who showed up today … outnumbered the right-wing extremists by as much as 10 to 1.” The antifa mobilization in Chapman Square and the “Portland United Against Hate” rally at City Hall numbered well over 1,000 people each. The bosses’ press gave little play to the labor action, basing themselves on the numbers of who said they would attend on Facebook pages. 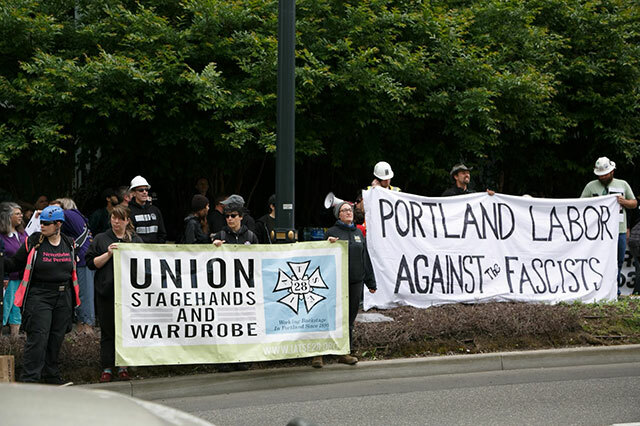 Yet the labor action was not organized on the Internet and social media but through the unions themselves, and some 300 unionists and supporters came out, chanting for hours until the racists climbed on buses heading back out of Portland. The union called for a “demilitarized, decriminalized public transit system” and reiterated its position for free public transit. The June 4 labor mobilization was the result of months of work. The initial motion calling for union action against the fascists was passed on November 16 by Painters Local 10, in response to the explosion of racist attacks following the election a week earlier of Republican Donald Trump as president. This followed the groundbreaking resolution passed by Local 10 last August, calling to break with the Democrats and Republicans and for a class-struggle workers party. An official IUPAT banner with those calls was front and center in the June 4 labor mobilization. This underscored that while nativist fascists like the Ku Klux Klan and other violent racists have been emboldened by Trump’s win, the police power that has backed them up, in Portland and elsewhere, was greatly expanded under Democrat Barack Obama. 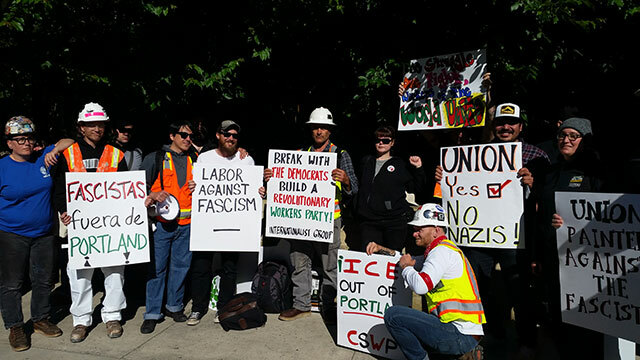 The urgency of labor action against the racists and fascists sharply escalated following the May 26 murder of two courageous men, Ricky Best and Taliesin Myrddin Namkai-Meche, and near-murder of Micah David-Cole Fletcher, by a local Nazi, Jeremy Christian. They had come to the aid of two young African American women, one of them a Muslim wearing a hijab (Islamic scarf), who the killer was menacing. The racist double murder shook liberal Portland’s smug self-image to the core. Yet this is the whitest major city in the U.S. and in the not-so-distant past it was a hotbed of fascist skinheads. The state of Oregon was founded as a “racist white utopia,” in the words of an analyst of black history in the Pacific Northwest, and had a host of “sundown” towns with laws to keep out black people and other non-whites (see “Portland’s dark history of white supremacy,” Guardian (U.S. edition), 31 May). As Portland reeled under the shock of the hideous murders, thousands of Portlanders wanted to take action to stop the killing. However, this effort was undermined by a diversion at City Hall organized by the social democrats of the International Socialist Organization (ISO) along with various liberals in collaboration with city authorities, which explicitly opposed confronting the fascists. Mayor Wheeler, who is also police commissioner, initially tried to get the federal government to ban the racist rally. When that was denied, he opted instead for massive police deployment combined with the City Hall “unity against hate” love-in. Yet despite warnings of all-sided violence, as noon approached on Sunday, you could see many people walking across the bridges to downtown Portland with homemade signs to protest the racists. Hundreds of union members and supporters in Portland, OR came out on June 4 to oppose racist/fascist rally. At the labor mobilization, organizers emphasized the vital importance of bringing out the enormous strength of the working class, chanting “Drive the Nazis out! Portland labor has the clout!” “Portland, this is the hour – immigrant/black/union power!” and “We’re here to shut the Nazis down, Portland is a union town!” In opposition to the massive police mobilization, protesters shouted, “Fascist terror we must stop – Don’t beg the mayor, don’t beg the cops!” And they stressed the need for labor to take up the fight against all forms of social oppression, chanting “Muslim rights, union rights, same struggle, same fight, workers of the world, unite!” This message was repeated over and over for black rights, women’s rights, gay rights, trans rights, abortion rights and immigrant rights. 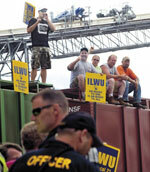 The chants were taken up by the crowd and boomed out by the mobile sound system put together by union workers. Demonstrators called out the names of our martyrs Ricky Best and Taliesen Namkai-Meche, Mulugeta Seraw (an Ethiopian student murdered by white supremacists in Portland in the 1980s), Richard Collins (the black student stabbed to death by a racist at the University of Maryland only two weeks ago), Larnell Bruce (the young African American run down by a white supremacist in nearby Gresham last August), Matthew Shepard (the gay man tortured to death in Wyoming), James Byrd (the black man dragged to his death by white supremacists in Texas) and Trayvon Martin, murdered by a racist vigilante in Florida. “We have to know who are our friends and who are our enemies. We cannot rely on the police to clear out the fascists. We’re looking right now as the police are attacking hundreds of people who came out here to say the fascists have no place in Portland. The people who called for a counter-demonstration that was not going to try to stop the fascists, collaborating with the police and with the mayor, are undercutting the necessary struggle. “So we’re watching here today the capitalist state in action. We need to mobilize the power of our class, of the working class, to be able to throw the fascists out, to drive them out of Portland. The people who were rallying over there [the antifa protest in Chapman Square] are on the side of the working class. They’re opposed to the fascists, and the state has protected this racist scum over here [in Schrunk Plaza], the same people that spawned these murders, the double murder and near murder of the brave people who stood up for Muslim women. Police attacked antifa protesters with flash-bang grenades, tear gas and rubber bullets. “It’s necessary to mobilize our power of the working class, politically – because this is directed against immigrants. Trump says he wants to deport 11 million immigrants. Under Obama, the Democrats already deported 5 to 8 million immigrants. Billed as a “Trump Free Speech Rally,” the plaza was chock full of neo-Nazis and paleo-fascists who thirst for genocide, all under police protection. 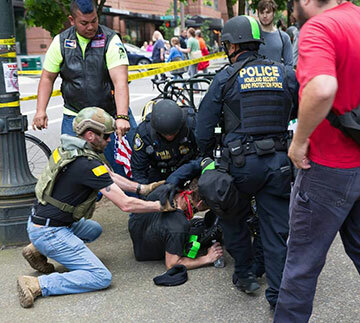 Many of the participants in the June 4 “Trump Free Speech Rally” may have been your run-of-the-mill white-supremacist right-wingers, but the motley crowd of a few hundred was shot through with neo-Nazis, paleo-fascists and militias. The Vancouver, Washington man who called the rally, Joey Gibson, has two fronts, Patriot Prayer (which also called the April 29 rally where the murderer Jeremy Christian was giving Nazi salutes and calling to “kill Muslims”) and his militia, Warriors for Freedom, LLC. Among the Hitlerites were the Traditionalist Workers Party with its “Diversity = White Genocide” signs and Identity Evropa, whose local rep was photographed shaking hands with Christian on the April 29 march . The self-promoting social-media fascists “Based Stickman” (Kyle Chapman from the Bay Area), “Based Spartan” (Pat Washington from Seattle) and “Baked Alaska” (Tim Gionet, originally from Anchorage) flew in to sign autographs for their alt-right fans and prance around for the cameras. But there were also sinister fascist “Patriot” militias, the “Oath Keepers” and the “III Percenters” in olive drab, who patrolled Schrunk Plaza on June 4. These paramilitary groups boast of many active-duty police and ex-military, and the thugs with yellow stripes on their makeshift uniforms worked closely together with the police. Still, with the racists vastly outnumbered and the Plaza surrounded on three sides, if it was not for the massive police presence and the diversion by the liberals and reformist leftists who organized the City Hall rally in coordination with the mayor/police chief, the racist provocation by white supremacists and Nazi lovers could have been stopped. The significant turnout of union members and supporters on June 4 in a labor action against the fascists, unprecedented in recent years, shows the potential. And there will certainly be a next time, as decaying capitalism spawns the fascist gangs who would destroy the organizations of labor and unleash deadly violence against all the oppressed. There has been lots of loose talk on the left labeling Trump a fascist. The Maoists of the utterly reformist Revolutionary Communist Party (RCP) and its RefuseFascism.org liberal front group call to “drive out the fascist Trump/Pence regime.” In practice that means bringing back the Democrats. So the “fascist” label serves to justify an “anti-fascist popular front” with another section of the capitalist ruling class. But as we wrote earlier this year, “being a vicious anti-Mexican, anti-Arab, anti-black race-hater, a sexist and national chauvinist, a union-basher and advocate of unfettered police power, does not in itself make Trump a fascist.” We noted that in the U.S. today, there is not a mass fascist movement, since the ruling class does not feel immediately threatened by a radicalized working class, mainly due to the sabotage of struggles by the pro-capitalist bureaucratic misleaders of labor. Still, “actual fascists are crawling out of their holes and looking forward to the Trump years” (see “Donald Trump, the ‘Alt-Right’ and Fascism,” The Internationalist No. 46, January-February 2017). Both in the 1930s and today, the growth of fascism was/is a result of capitalist economic crisis. Since the 2007-2008 crash we are in an ongoing worldwide depression. Despite lying government statistics, there are still tens of millions of unemployed. This has bolstered fascist parties like Golden Dawn in Greece and the National Front in France, and has spawned new fascist outfits in the U.S. As Trotsky wrote of Hitler’s Nazis in Germany: “Through the fascist agency, capitalism sets in motion the masses of the crazed petty bourgeoisie and the bands of declassed and demoralized lumpenproletariat – all the countless human beings whom finance capital itself has brought to desperation and frenzy” (“What Next? Vital Questions for the German Proletariat” ). The capitalist rulers resort to these terror gangs to preserve their endangered rule. That the fascists are not just some “fringe groups” or “fight clubs” was underscored by the recent statement by the top Republican official in Portland that his party was considering using militias, “like the Oath Keepers and the Three Percenters,” as a “security force” for public events rather than relying on police (Guardian [U.S. edition], 29 May). And the fact that newly formed fascist groups are forming squads to attack antifa groups, like Chapman’s “Fraternal Order of Alt-Knights” linked to the “Proud Boys,” or the “DIY Division” that appeared with swastikas at a pro-Trump “Make America Great Again” (MAGA) rally in Orange County, California in March, underscores that they are gearing up for violent street-fighting, and ultimately civil war. The fascists use vulnerable sectors as scapegoats. In Germany the Nazis demonized Jews as the “enemy within.” In the U.S.A. today, their prime targets are Muslims, immigrants and African Americans. And they are deadly dangerous. In November 2015, a III Percenter shot five people at a Black Lives Matter encampment in Minneapolis protesting the cop killing of Jamar Clark. This underscores the need for class-struggle militants to redouble efforts to build effective workers mobilizations to drive out the ultra-rightist racist and fascist thugs. As the Nazi fascists were threatening to seize power in Germany, the Bolshevik revolutionary Leon Trotsky urgently called on Communists and Socialists and the unions to join in united-front actions to stop these killers who would sweep away all the rights and gains won by the workers movement and with them the last vestiges of bourgeois democracy. Tragically, these warnings went unheeded, and Hitler took power in 1933, voted in by parliament without resistance by the Stalinists and social democrats. The next year, as provocations by fascists and other ultra-rightists erupted in France, Trotsky wrote insistently that to counter the fascist gangs, “what is needed is a workers’ militia.” He explained: “The struggle against Fascism is basically a political struggle which needs a militia just as the strike needs pickets. Basically, the picket is the embryo of the workers’ militia” (L.D. Trotsky, Whither France? ). Yet, he added, “The militia in itself does not settle the question. A correct policy is necessary.” And that requires above all the leadership of a revolutionary workers party with a program to sweep away the capitalist system which breeds and makes use of the fascists. Yet the policy of the Stalinists and social democrats was instead to form “anti-fascist popular fronts” chaining the workers to the supposedly “democratic” bourgeois parties that everywhere served as a roadblock to prevent revolution, leading to bloody defeats at the hands of fascists and militarists, from Spain and France in the 1930s to Chile in the 1970s. On a vastly smaller scale, that is what the City Hall rally on June 4 represented: an alliance with the Democratic Party mayor against trying to stop the fascists. Today, following the election of Donald Trump, a new generation of fascists are raising are heads. They are still small in numbers, and can be crushed. But sheer numbers of opponents are not enough. So long as the unions and black, women’s, gay and immigrant rights organizations are bound to the Democratic Party, they cannot defeat the fascists, for the violent partisans of Trump have the same class interests as Obama, Clinton and Bernie Sanders: they all defend capitalism. Writing in the lead-up to the November elections, we called for a revolutionary workers party with a program of sharp class struggle, including “for workers defense guards to defeat strikebreakers and fascist gangs” (“The Election From Hell, Whoever Wins, We Lose,” The Internationalist No. 45, September-October 2016). The Internationalist Group has continued to fight for workers mobilization against the fascists, and for building workers defense guards. In our article written the day after the election, we warned: “As violent racist and outright fascist forces are emboldened by Trump’s victory, Muslims and Middle Eastern immigrants in particular may be singled out for attack. Class-conscious militants should begin the work now of building workers defense guards, based on the mass organizations of the working class and oppressed, to counter this threat” (“Post-Traumatic Election Shock: Defeat Trump … And the Democrats, Fight for Workers Revolution!” The Internationalist No. 46, January-February 2017). As with the Trotskyists in the 1930s, our revolutionary program is not empty rhetoric but a guide to action. In the Pacific Northwest, as reports circulated of plans for race-hate rallies by fascist groups like the Ku Klux Klan, members of Class Struggle Workers – Portland put forward the resolution passed by Painters Local 10 to mobilize against provocations by the KKK and other racist forces. As we wrote earlier this year: “Revolutionists should seek to organize mass labor-centered mobilizations to crush the fascist provocateurs as they attempt to make forays into urban centers of the multiracial working class.” The June 4 labor action is the product of that effort. And as we noted then: “In the context of such a mobilization, a squad of demonstration marshals could become the nucleus for labor-based defense guards that can effectively disperse the lynchers and Nazi scum” (“Donald Trump, the ‘Alt-Right’ and Fascism”). 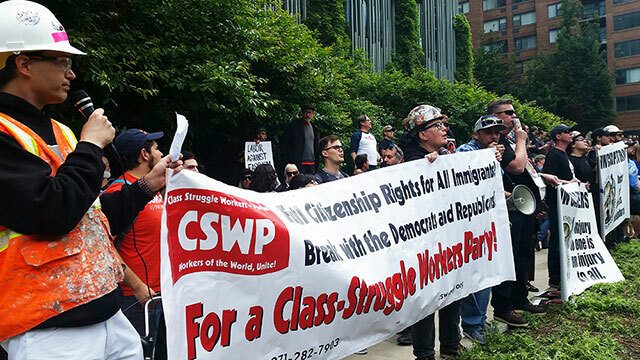 The June 4 action was a major achievement for class-conscious workers in Portland, demonstrating that workers action is possible, gaining political authority and carrying out the political program put forward by the Internationalist Group of working-class mobilization against the racists. This mobilization should spur workers and those who would oppose the race-haters and immigrant-bashers to action throughout the U.S. and beyond. 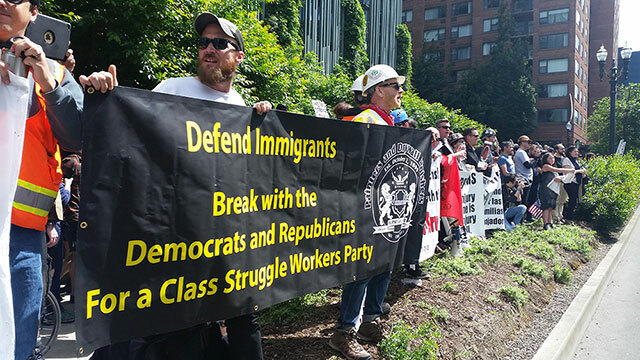 As the first significant labor mobilization against fascists in the U.S. in decades, it sets a starting point for building workers defense guards against the white-supremacist gangs. And as the banners of the CSWP and the Painters union highlighted, to unchain the power of the working class it is essential to break with the Democrats and Republicans, and build a class-struggle workers party. June 4 is only a beginning. We were aided by our collective past experience in organizing to stop the fascists in the U.S. in the 1980s and to defend immigrants against Nazi threats in Germany in the early 1990s. We also learned a lot in the course of the intense activity of the last two weeks. A key challenge in the coming struggles will be to greatly expand the core of marshals coming from several unions and to undertake systematic training. Building an organized workers defense will be crucial not only against the fascists but also in the struggle to stop the deportations of immigrants, as well as to defend Muslims, blacks, Latinos, women, gays and lesbians against the forces that spewed their venom in Schrunk Plaza on Sunday. The labor mobilization stood its ground for over six hours, until the last of the fascists departed.